Water tanks come in a variety of sizes and shapes from around 500 litres to many mega litres ( mega = 1 million litres). In the domestic application tanks today are generally roto moulded polythene in made in sizes from carry containers of 5 litres or so through to around 30,000 litres limited by transportation parameters. Tanks larger than this are generally steel assembled on site, although in many instances a tank farm using a cluster of larger polythene tanks can be interconnected to hold larger capacities with the economy of installation still being relevant. Most importantly for all tanks is the foundation must be sound- a failed foundation results in a failed tank and no warranty. Along with this all tanks should be secured. Simply, a tank is not always full when high winds occur and failure to attempt to secure could jeopardise an insurance claim if one was necessary. Polythene – one of the wonders of modern day plastics- introduced to Darwin in the mid 1990’s have by and large stood the test of time and the elements. They are mainly circular and sizes up to 30,000 litres with a diameter of up to 3.5m to allow transportation as wide load not escorted. The most popular sizes are 10,000 and 25,000 litres at economical prices with durability exceeding the older corrugated galvanised tanks. After viewing the sizes available please contact us for further information. 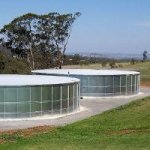 Steel Liner Tanks – an inexpensive water tank with steel sides & roof and the water being held captive by a liner or bladder. Our range is from 27,000 litres (27kl) to 600 kl in a heavy duty range suited to our conditions. Side walls are 1.0mm thick in smaller sizes then 1.6mm thick galvanised material in larger sizes, not a flimsy 0.6mm as are many on the market. The liner used is Trafab (RegTM) food grade polythene woven material which is the only material that can boast 20 years excellent service in the Territory. Most have not seen 10 years. For most sites a steel roof must be used. Unwanted vermin is kept out when a roof is used, and it protects the liner from our harsh environment, not to mention the health implications in potable water tanks. Please contact us for pricing to suit your application. Steel Squatters Tanks are heavy duty construction for agriculture, mining, industrial and municipal applications. Sizes range from 9kl through to 3 Ml. The hot dip galvanised angle frame is the backbone of the tank range, with side & bottom panels being galvanised, or polymer coated steel galvanised sheet dependent on the application , water quality and life of product required. Tanks can be supplied and installed with a variety of options including concrete floors where appropriate, ladders internal & external, hatches including side wall entry, ventilation, level indicators, scour sumps, roof perimeter handrails, non cyclonic and cyclonic wind rated slight pitched and conical roofs. The conical roof whilst more in capital outlay is by far more cost effective long term roof in the tropical conditions. For your next major tank installation check the pamphlet for applicable gross capacities after making allowance for fittings, air gaps etc then please contact us for a quotation for your needs.